The video image (right) not only provides the business owner with a clear record of the cash (and the till transactions) it's an exceptional opportunity to train new employees. A major frustration of every business owner is when an employee errantly provides incorrect change. ten..." (returning a dollar bill), "and ten is twenty." 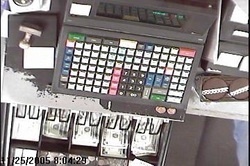 the customer's cash and place it in the proper till location(s). The above represents one aspect of good employee training - telling the new employee what to do. Experts suggest that we remember ~10% of what we hear - so just "telling" your new employee how it's done properly not a very effective means of training is it? Fortunately, human beings are also visual learners - which is where your digital video system comes into play. When you're training a new employee, show them a video clip (preferably with audio) of the process being done right. This is also a very positive way to "let the new employee know," - they're being watched. Remember, preventing undesirable behavior is a key benefit of your video system - proactively use it. Seeing represents another 50% of how we humans learn so you can rest assured if you use it properly, your video system is being used for something other than security. The last aspect of your new employee training should then (after you've told them and after you've showed them) is to have them actually do it. ... choose whatever applies to your business. Your GuardDog Security Video system can be effectively used to create proper "how-to training" videos and good employee training incorporates your video security system.